Radio programme yesterday and the DCI who knew what and how to be a police officer finding after 19 (NINETEEN YEARS) ineptitude, inefficiency, stupidity and CORRUPTION in the MET failed the Stephen Lawrence family. How I agree although I have not yet waited for 19 years, only 16. And no one replied to my emails asking for a copy of a form YOU thanked me for completing a year ago when I had not requested a form, I had not received one, I had not completed one nor had I posted one. SOMEONE CLEARLY DID and IN MY NAME, I think I am entitled to a copy. I attach photos of this week, back in Uk and another sleazy recruit goes to POST AS IF SHE IS and she as “proof” wears a garment the Gestapo here think will be proof she is me “seen posting”. I asked a woman minutes later to take the photo of me and what I wore: it can be seen that the recruit was instructed what to wear and she with “ginger hair” which is too dark for my colour BUT this is how MAIL IS SENT and RECEIVED as if it is for/ from me. Those who sign recorded and special delivery in 30 Fell View (WILLIAMS a bankrupt old roughneck with drink and smoking related problems and a husband with ID as MR CARL WOODS to be me!!) and AGNES JACKSON in 26 as me as her identical twin, Jarvis in 41, McHarran in 45, Mills in 20 and so on, they are all apparently me. My hearing and seeing the mail signed for delivered to those fraudsters and thieves with corrupt Royal Mail (all proven) was apparently a delusion of mine. Well they would say that, wouldn’t they? This is the TOKEN FRAUD with much sinister implications. 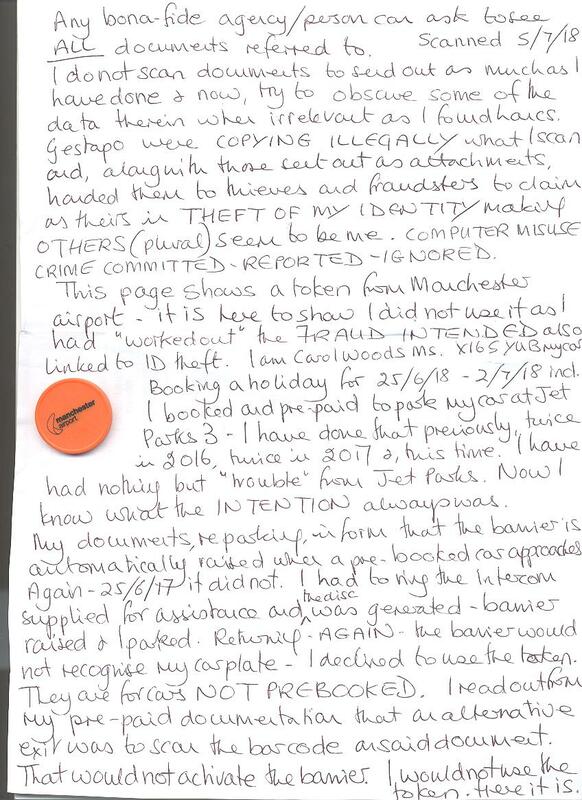 The first page is the MANCHESTER AIRPORT Jet Parks 3 token which I was issued with on 25/6/18 when I went to park my car, pre-booked and paid for, why would the barrier not raise for my plate? That is the system, the plate is recognised as PRE-BOOKED automatically raises and the car can be parked. They mess me about every time and this is the 5th from June 2016. I have learned a lot. Previously I had used Liverpool airport without trouble. I am Carol Woods Ms 28 Fell View LA2 9RP sorry I have no phone. My documents say that I can scan my bar code if the barrier does not raise. I could not scan it, I had to ring the intercom for assistance was delivered of the token. Now I know why they do this: on my return, the barrier does not raise, I try to scan my bar code, it will not raise (there is ALWAYS a troll behind me who has not paid and they wait to leave behind me as they are me with MY documents as pre-paid and pre-booked) the Gestapo are manufacturing “evidence” that my car is not pre-booked and pre-paid to park as I am not me with my car and apparently have been out of UK yet again using a false passport! I read the document to the thug dealing with me: he wanted me to use the token, no, I would not, I was pre-paid and pre-booked and was not using the token to suggest otherwise. He gave in. What was the background? The harassment at Best Western Masonic strognhgold anywhere in world and nothing but harassment to pretend I was someone the Gestapo are desperate to invent me as to cover for their PERJURY 2015 and worse and use of UNINSURED LOWLIFE with cars BOUGHT for them when they have no licences e.g. TRAVIS DALTON 45 Fell View LA2 9RP. I report that and hey presto, they reverse in Masonic inversion lunacy and try to make me UNINSURED as someone else. Illegally monitored they knew my holiday arrangements. Setting off AS USUAL I expected the thugs to be out and about even though I set off hours earlier than necessary. I drove round, they started to act behind my back thinking I had driven off and thus were manufacturing events to PRETEND I was someone else driving off. I drove back and caught RAC thugs pretending outside 28 that someone had called them WHEN I HAVE NO PHONE AND HAVE NEVER CALLED THEM OUT. They have done that before to invent a phone for me so I have cancelled by membership. But then an old lecher in 17 Leslie Ave off Fell View, a pest and stalker used over weeks GIBSON, waits in B6 ROV which he pretends he drives me about for me! He sets off with his “disabled” wife and they could have been pretending anything at all so I took this; they were in that vehicle: I was not and am never likely to be. The background to giving the lunatics the “idea” was from my report of unemployed lowlife sent to use 13 (then 15) Fell View and stalk me to pretend she was me or at least linked to me driving her car Y274 FWP: this smashed window not repaired for MONTHS led me to suggest she was not insured so I needed to be punished for that. I was to forget MY car window smashed by lowlife in an insurance fraud to use WILLIAMS in 30 Fell View who is ANOTHER to claim to be me which failed thus this troll was sent Jan 2018. Her car window is not even the same window as mine smashed. 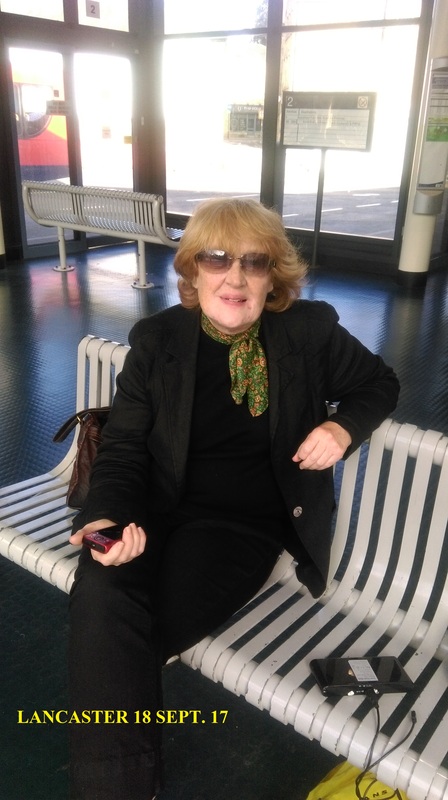 I saw her, she was dark haired and rough, she was to be the person the Gestapo have tried to claim is me for YEARS, a niece of mine, one I have no contact with and have not had for many years JOANNE HALL of Oldham who does not and never has driven. Why she is used will become clear over weeks. By the time I was approaching the ring road to Jet parks 3 (after much else on way incl bent cops stalking to intimidate and harass) I find this one another Joanne Hall walking to the car park; she from Lancaster had lost weight, lost her tattoos and lost her shopping, but this one also not like Joanne was to be seen and thus PROOF I was Joanne HALL and she drove my car. The pre-booking and pre-payment a problem as the passport and holiday is paid for all at the same time which was why she had to have no pre-booking or pre-payment. I take photos of everything: the token FRAUD found out and failing (despite the yob sent to hide in room 212 or 213 opposite my room where he as they do anywhere I stay and they are all on film as well, uses his laptop or phone and pretends it is my use as it is near me. They all rush off when they hear me open my door). All that was to be part of making me into someone else and Joanne will not know how she is STILL used. So, the dark hair thuggery fails then what? On the evening of 3/7/18 after the POSTING FRAUD (see related email and photos) they send this troll to march up and down outside me, we have reverted to bleached blondes again; and then on 4/7/18 WOODRUFF thief, fraudster, E-CRIMINAL from 2 and 45 Fell View caught stalking me as she bleached hair like this poses as MY DAUGHTER. The Gestapo on hand as ever to confirm they saw her car thus she was driving me to Lancaster. They do not see my car, it is RED and therefore INVISIBLE. Incidentally, outside the car park after midnight when I drove off, they had ANOTHER to stand about to be seen, they had not known their token FRAUD would fail. 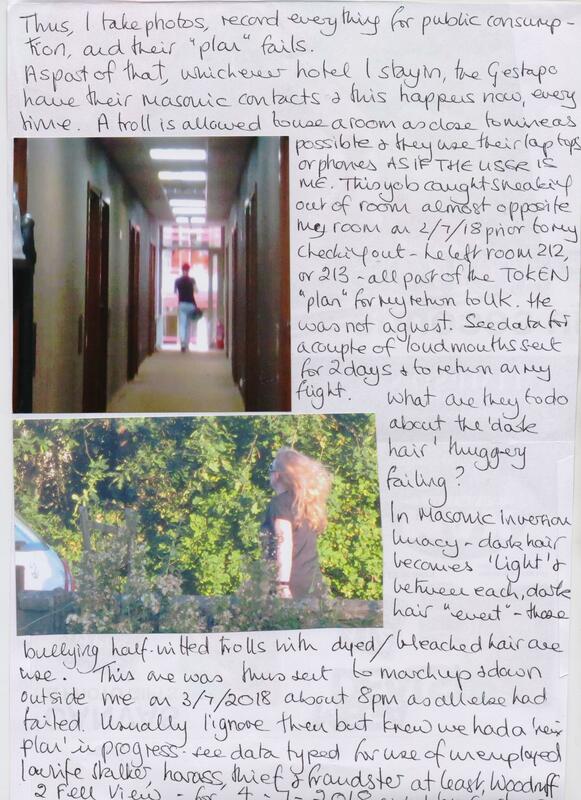 How did she get to that point at that time and how was she to get to where she had been sent from?Tis to FCO given the harassment and thuggery reported while away which was to be part of the INTENDED PLAN TO SEE ME OFF. Ends Please feel free to quote me. 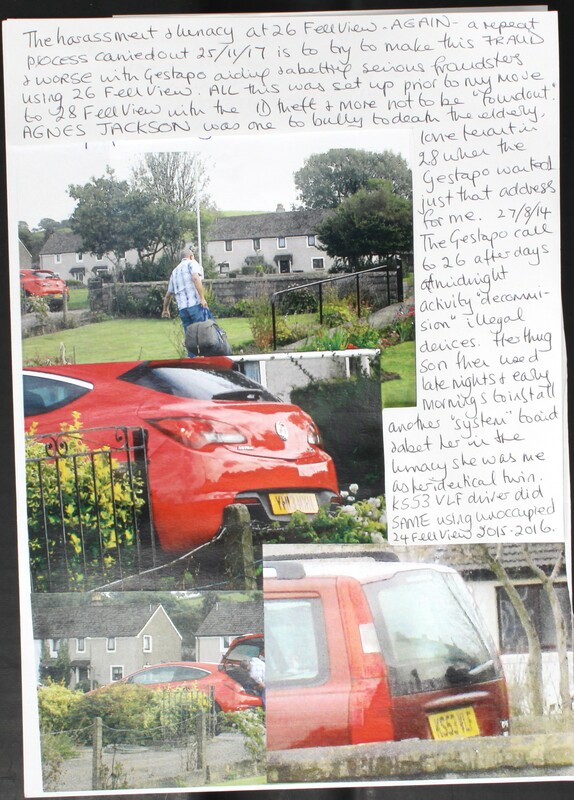 The data with the photos which show 2 males removing a car from 24 Fell View LA2 9RP in June 2018, House of thief and fraudster CURWEN who is ONE to flatter himself that he is married to me and I am his disabled wife. He has no disabled wife; he’s a thief and fraudster and is aided and abetted to PRETEND. Why move this car with this wagon? (It was a farce, it went on for hours and then they nearly dropped it onto the car parked at 39. Who needs TV with this lot going on daily?) I am Carol Woods Ms of 28 Fell View LA2 9RP. Sorry I have no phone whatever the Gestapo try to manufacture. Please feel free to quote me. See the return of YK02 VPF to Flat 5 LOOTER OF THE DEAD Dec 2013 Penhale Gardens LA3 2QA when I rented Flat 3. Those in some of the 24 flats had bullied to death at least 2 lone persons AND LOOTED THEIR ASSETS. 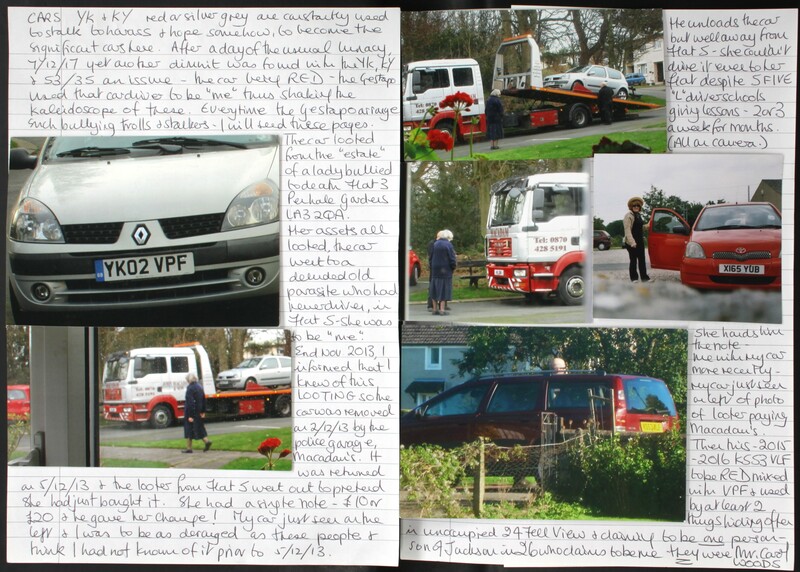 She in Flat 5 was given a provisional licence IN MY NAME by CS RICHARD BAYLY and they pretended that I had not seen YK02 VPF prior to Dec 2013 in sheer lunacy. I had moved to rent Flat 3 on 1/7/13. 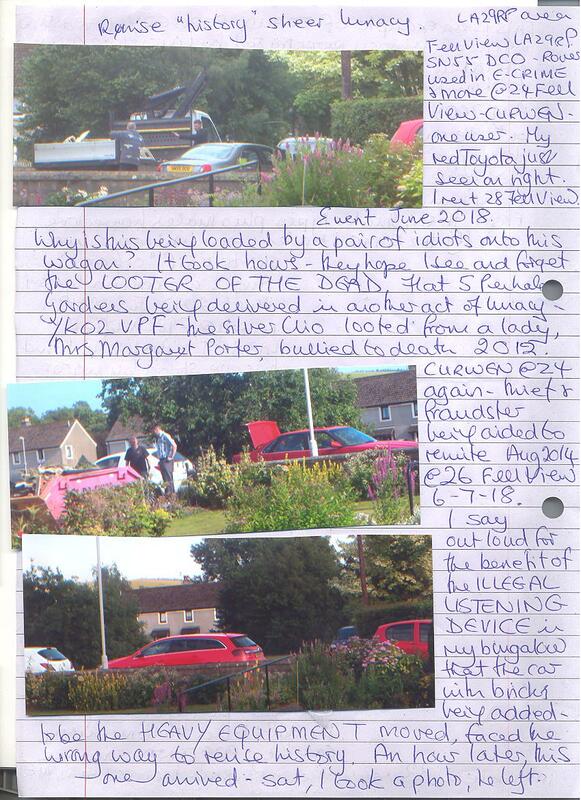 It had taken me to late Nov 2013 to find out FULLY what had been taking place on the Penhale Gardens site. Thus YK02 VPF was removed by police garage MACADAM’s and then 3 days later returned and the lunatic in Flat 5 pretended to buy it as he pretended just to be selling to her, she had a £20 or £10 note and he gave her change! Without photos, no one would believe this. Without going into all that, the photos of the LOOTED CAR YK02 VPF now with Flat 5 tenant, were to be “revised” using another thief and fraudster to aid and abet him. THEY ARE ALL ME, IF I MOVED TOMORROW OTHERS WOULD BE ME AND THE GESTAPO WOULD ARRANGE ALL THESE EVENTS AGAIN. The photos I send out are a few from thousands I have at all addresses where I have rented under duress. The car at 24 ROVER SN55 DCO was not Curwen’s in 2014: I found a yob hiding parked in the car at 24 while the yob used the Internet as if it was MY use in 28. 5 Sept 2014 late at night, I went out to see which yob/thug was doing that by lying across their front seats and hiding in use of phones in FRAUD pretending it was my use. I took photos finding the yob at 24 (mostly they use 29, 31, 34, and 45) and he raced off. The Gestapo then got Curwen out of bed where he was (MANY have at least 2 addresses in FRAUD which YOU fund as they ALL claim to be me as WOODS as well) and sent him to 24 in the Rover. The Rover then “disappeared” for a year as did Curwen from 24, and then reappeared briefly as he did, then disappeared then reappeared and parked on his drive, the life long parasite and unemployed suddenly could have at least 2 cars to use. The Rover then carted off in the EXPECTED PLAN TO SEE ME OFF after the holiday away with the Manchester airport thuggery PLANNED which failed because they are all more stupid than I am. 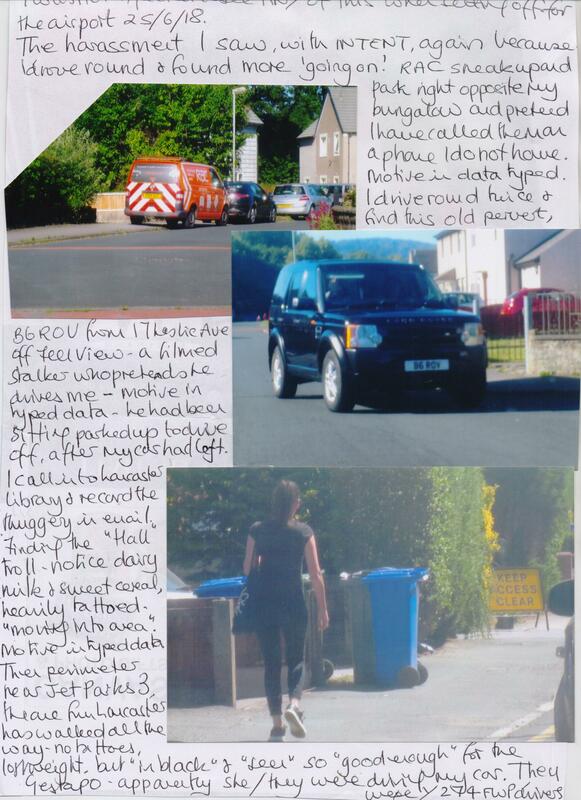 In the expectation that sleazy NHS could say to me, “No luvvie, you did not see YK02 VPF dropped off after being removed from Flat 5, all you saw was the Rover used in E-CRIME at 24 Fell View”. The INTENTION to have me arrested as someone posing as me was part of the PLAN for my return to UK. The Gestapo NEVER charge me, they ALWAYS include sleazy NHS and hope their malicious administering of drugs will ensure I “forget” events. Any one can ask about ALL that. Thus CURWEN yet again and the 2nd photo here, a male arrives on 5 and 6 July 2018 (to be the dates of Dec 2013 using Flat 5) and he moves a few bricks from the skip. That is the 5th skip to CURWEN which were all ordered IN MY NAME thus they try to rewrite all events in slum clearance at 24 – STILL. The bricks were “heavy” to be the heavy equipment moved by Gestapo from thief and fraudster JACKSON in 26 Fell View who was WIRED UP INDOORS TO BE ME. 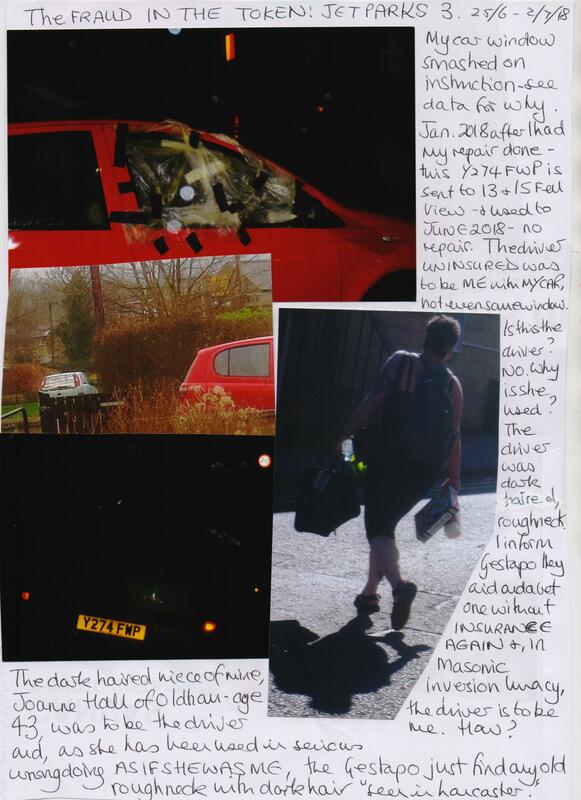 I found out fast (I moved to 28 on 24/3/14) with my comments as to how heavy the bag clearly was and the car used could identify the bent copper. (Jackson’s son, a real one, not one of the thugs sent to pose as her son see other data and please ask) then sneaked into 26 over days at 4 30am and reinstalled SOME of the equipment; they think I am blind deaf and daft. Out loud for the benefit of the ILLEGAL LISTENING DEVICE installed in 28,l I said that the car was facing the wrong way and an hour later they sent this idiot to park his red (Vauxhall) Insignia VU65 WKJ facing the “right way” and that was supposed to make me forget Aug 2014! I add the photos to show how they remind me. Carol Woods Ms PS MY red Toyota can be seen at my gate on many photos.